President Pervez Musharraf’s military's siege of a militant mosque stronghold this year makes him an infidel, Osama bin Laden said, urging Pakistanis to rebel against their President. The storming of the Red Mosque in Islamabad in July "demonstrated Musharraf's insistence on continuing his loyalty, submissiveness and aid to America against the Muslims ... and makes armed rebellion against him and removing him obligatory," bin Laden said in the tape. "So when the capability is there, it is obligatory to rebel against the apostate ruler, as is the case now," he said, according to a transcript of the tape released by Laura Mansfield, an American terror expert who monitors militant message traffic. 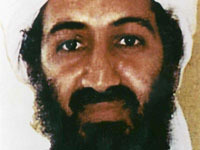 Bin Laden's voice was heard over video showing previously released footage of the terror leader. The video was released Thursday on Islamic militant Web sites.